I have got an Assassin misprint (in a recent pack ; it was ordered this year and have the new fifth monster). That mold was not modified, just reused. Can you provide some pictures of the die? I sadly can't (I have nothing to take picture). If you want the precise dice configuration, the 5 missile is on the face continuing the neck of the ID, the bogus 5 melee one is to the right, the 1 missile to the left, the 4 SAI on 'top', and the 3 melee opposite to the ID. You don't have a cell phone or anything. Hard to believe in this day and age that no one has a camera. My cellphone is 5 year old and don't take picture. I dislike the so called "smart"phone, it's simple as that. I bet someone in your surroundings is more than willing to instagram your die with a nice grainyvintage filter and a selfie . I'm quite sure some of the people here are on the verge of exploding with curiosity. since they had it archived. That mold (if it still existed) would be almost 20 years old. Seem's far fetched. If a mold like that was used, we should see more examples of this. After the Goblin misprint mistake, all the molds now have an alignment tab that makes sure they can only go together one way. So that was done way back in '96. Without a picture of the die, I refuse to even believe this die exists. I'm had a number of people tell me "I've got an unique misprint". Once I got a picture it was clear that they simply misidentified the die. So pictures or it doesn't exist. Here's my proof it exists. My misprint is indeed identical to that one, sword orientation and all. I too can corroborate the existence of these misprints, in the place of the three pistol face, I just opened a pack with a lava elf assassin that has the five sword face slightly off center from what the infiltrator uses. I can run some more pictures, I snapped these off on my phone just today. It took my VERY little time to find two still in poly bags. Has anyone pulled a REGULAR assassin from one of the new kickers? I need to know if it is all or only some. Trust me, I will be sending a VERY big kick in the pants to the parties responsible. I doubt we can fix it at this point, but we shall definitely let them know of our displeasure. 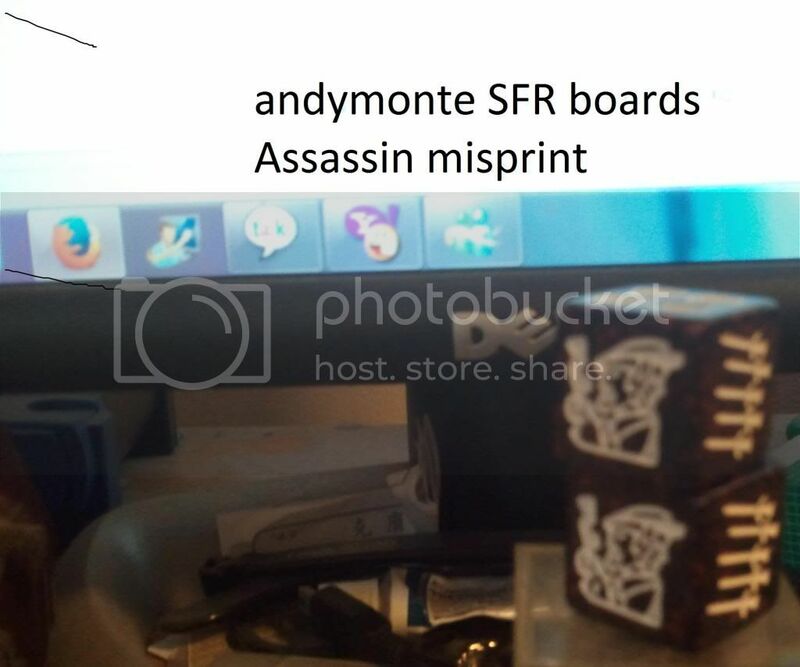 I have pulled four separate Assassins that had the correct layout from the new boxes, including the correct one that was shown in my original post here. Only some, as I've pulled correct Assassins as well. Ill have to check the recent elves i pulled. Thank you all. It will take several weeks of nightly communication to the factory that actually produced the dice to get info back to us. We have to go through multiple layers of communication and that takes time. I will share what I can, when I can. Good luck, I hope it was a small print run. All my other lava elves seem fine, but I don't have had an infiltrator. Logically, there should be another misprint with a 3-missile bogus face no ? I'm glad it wasn't any bigger of a print run, but we still have to deal with this for a while. I don't have the details yet, but I suspect this is NOT like the goblin misprints. (ie a swapped face) So I don't expect any additional misprints, but will eventually have to request a new pressing of lava elf rares so I can check all 70 dice that come out of it. We are going to have to discuss the tournament legality of this misprint, but I predict we will have to treat it as a game affecting misprint, just like the goblins from years ago.